interior that can be replaced easily in the field. 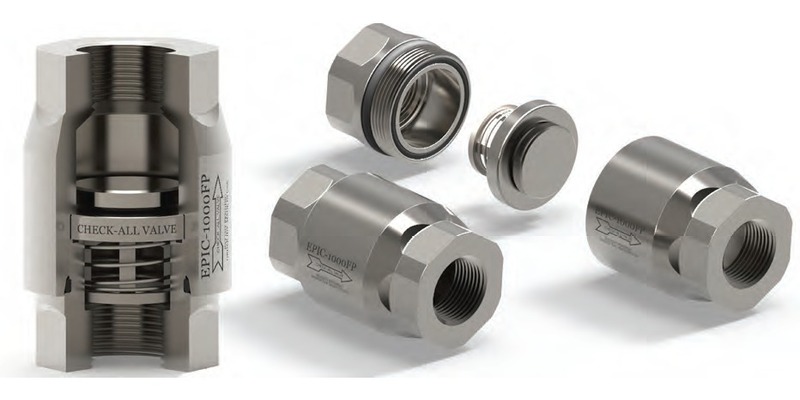 Check valves are employed throughout all types of fluid systems to prevent reverse flow. There are a number of styles or designs, each with attributes which determine its suitability for a particular application. Check-All Valve is a USA manufacturer producing a broad selection of check valves for industrial use. Their EPIC™ series of poppet style valves deliver a number of solid features. The check valves are available in male and female pipe connections, as well as double ferrule and flared tube. The valves are suitable for liquid, gas or steam application with sizes ranging from 1/8" to 1-1/4". Share your fluid system piping and control requirements with specialists. Leverage your own knowledge and experience with their product application expertise to develop the best solutions.